^ MH is the IATA designator and MAS is the ICAO airline designator. The flight was also marketed as China Southern Airlines Flight 748 (CZ748/CSN748) through a codeshare agreement. ^ The aircraft is a Boeing 777-200ER (for Extended Range) model; Boeing assigns a unique customer code for each company that buys one of its aircraft, which is applied as an infix in the model number at the time the aircraft is built. The code for Malaysia Airlines is "H6", hence "777-2H6ER". ^ Includes one passenger travelling on a Hong Kong Special Administrative Region passport. ^ The manifest initially released by Malaysia Airlines listed an Austrian and an Italian. These were subsequently identified as two Iranian nationals who boarded Flight 370 using stolen passports. ^ 38 passengers and 12 crew. ^ a b c Aircraft altitude is given as feet above sea level and measured, at higher altitudes, by air pressure, which declines as altitude above sea level increases. Using a standard sea level pressure and formula, the nominal altitude of a given air pressure can be determined—referred to as the "pressure altitude". A flight level is the pressure altitude in hundreds of feet. For example, flight level 350 corresponds to an altitude where air pressure is 179 mmHg (23.9 kPa), which is nominally 35,000 ft (10,700 m) but does not indicate the true altitude. ^ Heights given by primary radar are actual altitudes, unlike the pressure altitudes provided by secondary radar. ^ The agency's name changed on 1 July 2015. It was previously known as the Defence Science and Technology Organisation. * Malaysia Airlines' chief executive, Ahmad Jauhari Yahya, initially said air traffic control was in contact with the aircraft two hours into the flight, when in fact the last contact with air traffic control was less than an hour after takeoff. * Malaysian authorities initially reported that four passengers used stolen passports to board the aircraft before settling on two: one Italian and one Austrian. 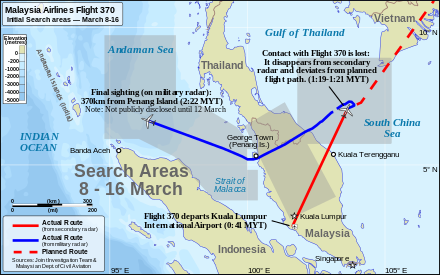 * Malaysia abruptly widened the search area to the west on 9 March, and only later explained that military radar had detected the aircraft turning back. This was later formally denied by Rodzali Daud. * Malaysian authorities visited the homes of pilot Zaharie and co-pilot Fariq on 15 March, during which they took away a flight simulator belonging to Zaharie. Malaysian police chief Khalid Abu Bakar said this was the first police visit to those homes. On 17 March, the government contradicted this by saying police first visited the pilots' homes on the day following the flight's disappearance, although this had been previously denied. * On 16 March, Malaysia's acting transport minister contradicted the prime minister's account on the timing of the final data and communications received. Najib Razak had said that the ACARS system was switched off at 01:07. On 17 March, Malaysian officials said that the system was switched off sometime between 01:07, time of the last ACARS transmission, and 01:37, time of the next expected transmission. * Three days after saying that the aircraft was not transporting anything hazardous, Malaysia Airlines' chief executive Ahmad said that potentially dangerous lithium batteries were on board. * MAS chief executive initially claimed that the last voice communication from the aircraft was, "all right, good night", with the lack of a call sign fuelling speculation that the flight may have been hijacked. Three weeks later Malaysian authorities published the transcript that indicated the last words were "Good night Malaysian three seven zero". ^ The exact amount of this compensation is 113,100 special drawing rights. Using the official exchange rates on 16 July 2014, this is worth approximately: RM557,000; ¥1,073,000; US$174,000; €129,000; or £102,000. 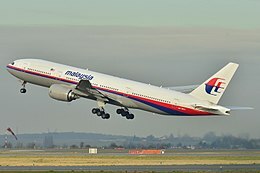 ^ In March 2014, a petition for discovery was filed in a US court by a law firm, not representing relatives of families, against Boeing and Malaysia Airlines. It sought to obtain the names of manufacturers of aircraft parts along with maintenance records. It was reported in the media as a lawsuit or that Malaysia Airlines was being sued. ^ a b MacLeod, Calum; Winter, Michael; Gray, Allison (8 March 2014). "Beijing-bound flight from Malaysia missing". USA Today. Retrieved 3 May 2014. ^ "New missing Malaysian plane MH370 search area announced". BBC News. 26 June 2014. Retrieved 15 November 2014. The search for the missing airliner is already among most expensive in aviation history. ^ "Search for MH370 to be most expensive in aviation history". Reuters. 8 April 2014. Retrieved 15 November 2014. ^ Pearlman, Jonathan (29 May 2014). "MH370 search becomes most expensive aviation hunt in history, yet still no clues". The Telegraph. Telegraph Media Group. Retrieved 1 June 2014. ^ a b "Flight MH370 'crashed in south Indian Ocean' – Malaysia PM". BBC News. 24 March 2014. Retrieved 8 May 2014. ^ a b c d "MH370 search: Mozambique debris 'almost certainly' from missing plane". BBC News. ^ a b c "Experts Complete Examination of Mozambique Debris" (PDF). MH370.gov.my. 24 March 2016. Retrieved 30 March 2016. ^ a b "Mozambique debris 'almost certainly from MH370': Australia". Associated Press. 24 March 2016. Archived from the original on 25 March 2016. Retrieved 24 March 2016. ^ a b "Identification of two items of debris recovered from beaches in Mozambique" (PDF). www.atsb.gov.au. 19 April 2016. Retrieved 11 May 2016. ^ a b "Ship hired to find MH370 arrives in search zone". The Star (Malaysia). 23 January 2018. Retrieved 23 January 2018. ^ "Norwegian vessel to arrive at MH370 search area this weekend". New Straits Times. 18 January 2018. Retrieved 19 January 2018. ^ "Malaysia says search resumes for missing flight MH370". Channel NewsAsia. 23 January 2018. Archived from the original on 24 January 2018. ^ Pither, Tony (1998). The Boeing 707 720 and C-135. England: Air-Britain (Historians) Ltd. ISBN 978-0-85130-236-2. ^ a b "Malaysia Airlines 9M-MRO (Boeing 777 – MSN 28420)". Airfleets. Retrieved 7 March 2014. ^ "Boeing 777-200 – Fleet". Malaysia Airlines. Retrieved 12 March 2014. ^ a b c d e f g h i j k l m n o p q r s t u v w x y z aa ab ac ad ae af Malaysia Ministry of Transport (8 March 2014). "Factual Information, Safety Investigation: Malaysia Airlines MH370 Boeing 777-200ER (9M-MRO)" (PDF). Malaysia Ministry of Transport. Malaysia: Malaysia Ministry of Transport. Archived from the original (PDF) on 9 March 2015. Retrieved 9 March 2015. ^ "Missing MAS 777-200 had no major prior incidents". Flightglobal. 8 March 2014. Retrieved 9 March 2014. ^ 浦东机场滑行跑道内东航马航两飞机剐蹭 [Two planes of Eastern Airlines Malaysia Airlines in the taxiway of Pudong Airport] (in Chinese). Xinhua News Agency. 10 August 2012. Archived from the original on 24 March 2014. ^ "ASN Wikibase Occurrence # 147571". 9 August 2012. Retrieved 24 March 2014. ^ Toh, Mavis (9 March 2014). "MAS 777 underwent maintenance in Feb". Singapore: Flightglobal. Archived from the original on 9 March 2014. Retrieved 12 April 2015. ^ a b "Malaysia Airlines: experts surprised at disappearance of 'very safe' Boeing 777". The Guardian. 8 March 2014. Retrieved 11 May 2014. ^ a b "Malaysia Airlines has one of Asia's best safety records". Reuters. 8 March 2014. Retrieved 9 March 2014. ^ "EgyptAir 777 fire probe inconclusive but short-circuit suspected". Flightglobal. 30 November 2012. Retrieved 30 March 2014. ^ "Accident: Egyptair B772 at Cairo on Jul 29th 2011, cockpit fire". Avherald.com. 29 July 2011. Retrieved 30 March 2014. ^ a b Patterson, Thom (17 July 2014). "A second lost Boeing 777 for Malaysia Airlines". CNN. Retrieved 18 July 2014. ^ CBC News (17 July 2014). "Malaysia Airlines Flight MH17 reportedly shot down near Ukraine-Russia border". CBC News. Dominion of Canada: Canadian Broadcasting Corporation. Retrieved 19 July 2014. ^ "Emirates flight from Trivandrum crash-lands in Dubai, passengers safe". Deccan Chronicle. 3 August 2016. Retrieved 3 August 2016. ^ a b c d "MH370 Passenger Manifest" (PDF) (Press release). Malaysia Airlines. 8 March 2014. Archived from the original (PDF) on 8 March 2014. ^ "HK resident was aboard missing plane". RTHK. 10 March 2014. Archived from the original on 20 March 2014. ^ Ranjit Singh (12 March 2014). "MH370: Five Indian nationals identified". astro AWANI. Retrieved 29 May 2014. ^ a b Budisatrijo, Alice; Westcott, Richard (11 March 2014). "Malaysia Airlines MH370: Stolen passports 'no terror link'". BBC News. Retrieved 9 May 2014. ^ a b "Missing Malaysia plane: The passengers on board MH370". BBC News. 17 January 2017. Retrieved 24 January 2019. ^ "Missing MAS flight: Captain piloting MH370 a Penang boy". The Straits Times. 8 March 2014. Retrieved 9 March 2014. ^ Koswanage, Niluksi (9 March 2014). "Pilot of missing Malaysian flight an aviation tech geek". Reuters. Retrieved 10 March 2014. ^ "MISSING MH370: Co-pilot family awaits for latest updates – Latest". New Straits Times. 8 March 2014. Archived from the original on 4 June 2014. ^ Watkins, Tom (10 March 2014). "First officer on missing jet was transitioning to 777-200s". CNN. Retrieved 10 March 2014. ^ a b c d e f Simon Denyer, Robert Barnes & Chico Harlan (9 March 2014). "Debris spotted may be from missing Malaysian Airline flight". The Washington Post. Archived from the original on 9 March 2014. ^ "No sign of Malaysia Airline wreckage; questions over stolen passports". CNN. 8 March 2014. Retrieved 10 March 2014. ^ "Loss of employees on Malaysia flight a blow, U.S. chipmaker says". Reuters. 9 March 2014. Retrieved 15 March 2014. ^ "Caregiver sacrifices time for family of passengers". New Straits Times. Archived from the original on 31 May 2014. ^ Kuhn, Anthony (20 March 2014). "For Flight 370 Families, Every Day Is 'Torment' : Parallels". NPR. Retrieved 11 May 2014. ^ "Missing MAS flight: Malaysia grateful for assistance in search and rescue operations, says Anifah". The Star. 9 March 2014. Retrieved 9 March 2014. ^ "Caregivers from Malaysia, Australia assigned to families of passengers onboard MH370". The Malay Mail. 9 March 2014. Retrieved 30 March 2014. ^ "Missing Malaysia jet may have veered off course". CNBC. Retrieved 12 March 2014. ^ "MISSING MH370: Families cling to faint hopes: psychologist". New Straits Times. 10 March 2014. Archived from the original on 11 March 2014. Retrieved 12 March 2014. ^ "Tweet". Twitter. Flightradar24. 7 March 2014. Retrieved 24 October 2014. ^ a b "Airspace Delegated to Malaysia" (PDF). Department of Civil Aviation Malaysia. Department of Civil Aviation Malaysia. 25 August 2011. Retrieved 24 October 2014. ^ a b c d e f g h i "Documents: Preliminary report on missing Malaysia Airlines Flight 370". Malaysia Department of Civil Aviation. Retrieved 22 October 2014 – via CNN. 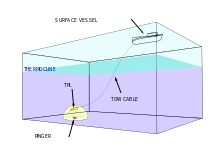 ^ a b c d e f g h i j k l m n o p q r s t u v w x y z aa ab ac ad "MH 370 – Definition of Underwater Search Areas" (PDF). Australian Transport Safety Bureau. 26 June 2014. Archived (PDF) from the original on 27 August 2014. Retrieved 12 April 2015. Lay summary. ^ a b c d e f g h "Signalling Unit Log for (9M-MRO) Flight MH370" (PDF). Inmarsat/Malaysia Department of Civil Aviation. Archived from the original (PDF) on 4 March 2016. Retrieved 29 June 2014. ^ a b c "MH370 – Flight Path Analysis Update" (PDF). Australian Transport Safety Bureau. Australian Transport Safety Bureau. 8 October 2014. Retrieved 15 November 2014. ^ a b "MH370: cockpit transcript in full". The Guardian. 1 April 2014. Retrieved 11 May 2014. ^ "FlightRadar24.com MH370 7 March 2014". Retrieved 12 February 2019. ^ "Malaysian Airlines System (MH) No. 370 ✈ 08-Mar-2014 ✈ WMKK / KUL – ZBAA / PEK ✈". flightaware. Retrieved 8 March 2014. ^ "Pilot: I established contact with plane". New Straits Times. AsiaOne. 9 March 2014. Retrieved 25 January 2019. ^ Cenciotti, David (11 March 2014). "What we know and what we don't about the mysterious Malaysia Airlines MH370 disappearance". The Aviationist. Retrieved 3 April 2014. ^ Forsythe, Michael; Schmidt, Michael (14 March 2014). "Radar Suggests Jet Shifted Path More Than Once". The New York Times. Retrieved 14 February 2015. ^ a b "Exclusive: Radar data suggests missing Malaysia plane deliberately flown way off course – sources". Reuters. Retrieved 28 September 2014. ^ Stacey, Daniel (1 May 2014). "Investigators to Re-Examine Clues in Missing Malaysia Airlines Flight 370". Wall Street Journal. Retrieved 13 July 2014. ^ "Vietnam says it told Malaysia that missing plane MH370 had turned back". The Straits Times. 12 March 2014. Retrieved 21 April 2019. ^ Doksone, Thanyarat (19 March 2014). "Missing Malaysia Airlines plane: Thailand gives radar data 10 days after plane lost". Sydney Morning Herald. Retrieved 7 July 2017. ^ "How could Australian radar miss flight MH370?". Special Broadcasting Service. 26 March 2014. ^ "JORN FAQ" (PDF). airforce.gov.au. 26 May 2016. p. 4. Archived (PDF) from the original on 14 September 2016. Retrieved 26 August 2016. 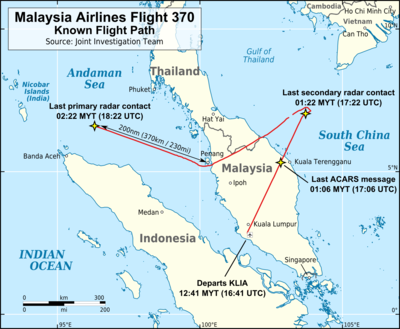 Based on the time of day that MH370 disappeared, and in the context of peacetime tasking, JORN was not operational at the time of the aircraft's disappearance. ^ a b c "Malaysian government publishes MH370 details from UK AAIB". Inmarsat. Retrieved 26 March 2014. ^ a b "Inmarsat breaks silence on probe into missing jet". Fox News Channel. Retrieved 26 March 2014. ^ a b c d e Broderick, Sean (1 May 2014). "First MH370 Report Details Confusion in Hours After Flight Was Lost". Aviation Week. Retrieved 22 October 2014. ^ "Inquiry details controllers' hunt as MH370 vanished". Flight Global. 1 May 2014. Retrieved 12 April 2015. ^ a b c "MH370 Flight Incident (Press statements 8–17 March)". Malaysia Airlines. March 2014. Archived from the original on 18 December 2014. Retrieved 22 March 2015. ^ "No MH370 Distress Call, Search Area Widened". Aviation Week & Space Technology. 12 March 2014. Retrieved 12 April 2015. ^ a b c Weaver, Matthew (24 March 2014). "Blog: Malaysia Airlines flight MH370 (March 24) – MH370 families attack Malaysian government over loss of plane". The Guardian. Retrieved 11 May 2014. ^ "Malaysia Airlines flight MH370: Distraught families told by text message to assume 'beyond doubt no one survived'". The Independent. 24 March 2014. Retrieved 25 March 2014. ^ Thomas Fuller; Chris Buckley (24 March 2014). "Malaysian Leader Says Flight 370 Ended in Indian Ocean". The New York Times. Retrieved 12 April 2015. ^ a b Rahma, Azharuddin Abdul (29 January 2015). "Announcement on MH370 by Director General" (PDF). Official Site for MH370. Department of Civil Aviation Malaysia. Retrieved 31 January 2015. ^ Martinez, Michael (19 March 2014). "Flying low? Burning object? Ground witnesses claim they saw Flight 370". CNN. Retrieved 19 May 2015. ^ Shears, Richard (21 March 2014). "Malaysian woman claims to have seen missing MH370 in the water near Andaman Islands on day it disappeared". Daily Mail. Retrieved 19 May 2015. ^ Pearlman, Jonathan (3 June 2014). "Malaysia Airlines plane search: British yachtswoman 'saw MH370 on fire'". The Telegraph. Retrieved 19 May 2015. 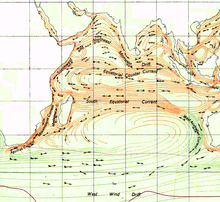 ^ "Search for MH370 Facts and statistics Surface search of the southern Indian Ocean 17 March – 28 April 2014" (PDF). jacc.gov.au. Joint Agency Coordination Centre. Retrieved 5 December 2014. ^ "MH370 missing Malaysia Airlines plane: Search might be in wrong spot, investigators say". News.com.au. 9 October 2014. Retrieved 19 October 2014. ^ "About Us". jacc.gov.au. Joint Agency Coordination Centre. Retrieved 5 December 2014. ^ Brown, Sophie (16 June 2014). "MH370: How long will the search continue?". CNN.com. Retrieved 15 November 2014. ^ "The Hunt for Malaysia Airlines Flight MH370 Continues". Newsweek. Reuters. 6 August 2014. Retrieved 15 November 2014. ^ a b "MH370: Families say search suspension for Malaysian plane 'irresponsible'". BBC News. 17 January 2017. Retrieved 17 January 2017. ^ Whitley, Angus (17 January 2017). "MH370 Search Ends to Leave Aviation's Biggest Mystery Unsolved". Bloomberg News. Retrieved 17 January 2017. Australian investigators put the cost of the operation at A$180 million ($135 million). ^ "After 3 years, MH370 search ends with no plane, few answers". Chicago Tribune. 17 January 2017. Retrieved 17 January 2017. The Joint Agency Coordination Center in Australia, which has helped lead the $160 million hunt for the Boeing 777 in remote waters west of Australia, said the search had officially been suspended after crews finished their fruitless sweep of the 120,000-square kilometer (46,000-square mile) search zone. ^ a b Greg Waldron (3 October 2017). "ATSB final MH370 report calls for more precise flight tracking". Flightglobal. ^ Knaus, Christopher (3 October 2017). "MH370's location an 'almost inconceivable' mystery – final report". Retrieved 17 October 2017. ^ a b c "ATSB Transport Safety Report, External Aviation Investigation, AE-2014-054: The Operational Search for MH370" (Final report). Australian Transport Safety Bureau. 3 October 2017. Retrieved 7 October 2017. ^ a b "US company resumes search for missing flight MH370". The Telegraph. Associated Press. 7 January 2018. ISSN 0307-1235. Retrieved 7 January 2018. ^ a b "MH370: Private company to resume search for lost Malaysia Airlines plane". Retrieved 7 January 2018. ^ a b "MH370 Operational Search Update #1" (PDF). oceaninfinity.com. Government of Malaysia. Retrieved 15 February 2018. ^ a b "A fantastical ship has set out to seek Malaysian Airlines flight 370". The Economist. ^ a b "MH 370 Operational Search Update #5" (PDF). oceaninfinity.com. Government of Malaysia. Retrieved 1 March 2018. ^ a b "MH370 Conclusion of current search for Malaysian Airlines Flight MH370". oceaninfinity.com. oceaninfinity. Retrieved 29 May 2018. ^ a b "MH370: Ocean Infinity search ends amid calls for new disclosures and further investigation". 8 June 2018. Retrieved 30 July 2018. ^ "RMAF chief: Recordings captured from radar indicate flight deviated from original route". Retrieved 28 September 2014. ^ "MH370 possibly in one of two 'corridors', says PM". Retrieved 28 September 2014. ^ Hodal, Kate (16 March 2014). "Flight MH370: Malaysia asks for help in continued search for missing plane". The Guardian. Retrieved 4 November 2014. ^ "India Continues Search for MH370 as Malaysia Ends Hunt in South China Sea". The Wall Street Journal. 15 March 2014. Retrieved 12 April 2015. ^ "Arrangements in Australia". Australian Maritime Safety Authority. Archived from the original on 24 February 2015. Retrieved 12 November 2014. ^ "National Search and Rescue Manual – June 2014 edition" (PDF). Australia Maritime Safety Authority. p. 231. Archived from the original (PDF) on 12 April 2015. Retrieved 12 November 2014. ^ "Australia agrees to lead search in Indian Ocean for missing Malaysia Airlines flight MH370". The Canberra Times. 17 March 2014. Archived from the original on 17 May 2014. Retrieved 12 April 2015. ^ "Missing MH370: Australia to lead southern search for MH370". The Star. 17 March 2014. ^ "Incident 2014/1475 search for Malaysian airlines flight MH370 planned search area 19 March 2014" (PDF). Australian Maritime Safety Authority. 19 March 2014. Archived from the original (PDF) on 1 April 2015. Retrieved 12 April 2015. ^ Jacobs, Frank (27 March 2014). "MH370 and the Secrets of the Deep, Dark Southern Indian Ocean". Foreign Policy. Archived from the original on 27 January 2015. Retrieved 14 February 2015. ^ "AMSA_MH370_MediaKit " 18/03/2014 – AMSA Search Area Charts". Australian Maritime Safety Authority. 18 March 2014. Retrieved 12 April 2015. ^ "Flight MH370: Images of ocean debris". BBC News. 28 March 2014. Retrieved 10 November 2014. ^ "Flight MH370: 'Objects spotted' in new search area". BBC News. 28 March 2014. Retrieved 8 May 2014. ^ "MH370 Lost in Indian Ocean: "Credible lead" moves search to new area". New Straits Times. 28 March 2014. Archived from the original on 4 June 2014. Retrieved 17 January 2015. ^ Shoichet, Catherine E.; Pearson, Michael; Mullen, Jethro. "Flight 370 search area shifts after credible lead". CNN. Retrieved 28 March 2014. ^ "Search and recovery continues for Malaysian flight MH370 (4 April 2014 am)". Joint Agency Coordination Centre. 4 April 2014. Retrieved 6 May 2014. 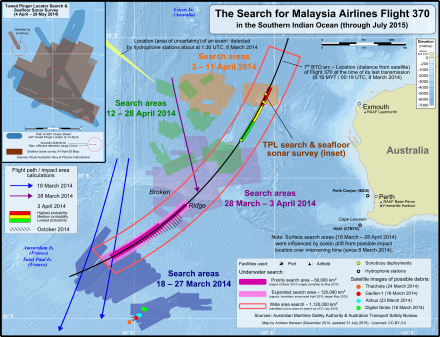 ^ "Incident 2014/1475 – search for Malaysia Airlines flight MH370 – area searched (4 April)" (PDF). Australian Maritime Safety Authority. 4 April 2014. Retrieved 12 April 2015. ^ a b Donnison, Jon (31 March 2014). "Malaysia flight MH370: No time limit on search, says Tony Abbott". BBC News. Retrieved 8 May 2014. ^ "Royal Navy Submarine Joins MH370 Search". Sky News. 2 April 2014. Retrieved 12 April 2015. ^ Varandani, Suman (4 April 2014). "Malaysia Airlines Flight MH370: Towed Pinger Locators Deployed, Underwater Hunt For Black Box Launched With Hopes Of A Breakthrough". International Business Times. Retrieved 23 March 2018. ^ "Pinger locator equipment commences operation (4 April 2014)". Joint Agency Coordination Centre. 4 April 2014. Retrieved 6 May 2014. ^ a b "Only days left before Malaysia airlines flight 370's black box dies". WDAY. 30 March 2014. Archived from the original on 1 April 2014. Retrieved 13 July 2014. ^ Ng, Eileen (8 March 2015). "MH370 report: Underwater locator beacon battery had expired". phys.org. Retrieved 7 July 2017. ^ Hawley, Samantha (8 March 2015). "Malaysia Airlines MH370: Report finds battery powering locator beacon on black box expired in 2012, no red flags raised over crew or aircraft". Australian Broadcasting Corp. Retrieved 8 March 2015. ^ Smyth, Jamie (26 June 2014). "Search for Malaysia Airlines flight MH370 to resume in new area". Financial Times. Retrieved 18 November 2014. ^ "Search for MH370". jacc.gov.au. Joint Agency Coordination Centre. Retrieved 14 December 2014. ^ a b "MH370 Operational Search Update". Joint Agency Coordination Centre. 8 October 2014. Retrieved 12 November 2014. ^ Innis, Michelle (6 October 2014). "Rugged Seabed Seen in New Maps Further Complicates Search for Malaysia Airlines Jet". The New York Times. Retrieved 18 November 2014. ^ "MH370 Operational Search Update". Joint Agency Coordination Centre. 5 November 2014. Retrieved 5 December 2014. ^ "MH370 Operational Search Update". Joint Agency Coordination Centre. 7 January 2015. Retrieved 8 January 2015. ^ "MH370 Operational Search Update". JACC. 9 December 2015. Retrieved 9 December 2015. ^ Stewart, Robb M (6 October 2014). "Malaysia Airlines Flight 370 Search Reboots". Wall Street Journal. Retrieved 8 October 2014. ^ "MH370 Operational Search Update". JACC. 14 January 2015. Retrieved 2 February 2015. Fugro Supporter is expected to arrive in the search area and commence search activities in late January. Fugro Supporter has been equipped with a Kongsberg HUGIN 4500 autonomous underwater vehicle (AUV). The AUV will be used to scan those portions of the search area that cannot be searched effectively by the equipment on the other search vessels. ^ "MH370 Operational Search Update". JACC. 28 January 2015. Retrieved 1 February 2015. ^ "MH370 Operational Search Update". JACC. 13 May 2015. Retrieved 2 June 2015. ^ a b c "MH370 Operational Search Update". Joint Agency Coordination Centre. 5 August 2015. Retrieved 8 August 2015. ^ "MH370 Joint Communique". JACC. 17 January 2017. Retrieved 20 January 2017. ^ "MH370: three companies approach Malaysia over restarting search for plane". The Guardian. Reuters. 17 October 2017. Retrieved 17 October 2017. ^ "MH 370 Operational Search Update #12" (PDF). oceaninfinity.com. Government of Malaysia. Retrieved 20 April 2018. ^ a b "MH 370 Operational Search Update #18". mh370.gov.my. Government of Malaysia. Retrieved 29 May 2018. ^ "Update on search for Missing Malaysian Airlines Flight MH370". OceanInfinity.com. 30 April 2018. Retrieved 30 July 2018. ^ Dewan, Angela (23 May 2018). "MH370 search to end on May 29 after four years". CNN. Retrieved 24 May 2018. ^ "MH370 hunt continues for few more days". 1 June 2018. Retrieved 30 July 2018. ^ "MH370 search: It's not over till it's over". Retrieved 30 July 2018. ^ "Ocean Infinity Donates Data to Seabed Mapping Project". 21 June 2018. Retrieved 30 July 2018. ^ "Ocean Infinity donates 120,000 square kilometres of data from search for missing Malaysian airliner to The Nippon Foundation-GEBCO Seabed 2030 Project" (press release). Nippon Foundation. 21 June 2018. ^ Zhou, Naaman (7 March 2019). "MH370: relatives call for 'serious commitment' from Malaysia to find plane" – via www.theguardian.com. ^ Withers, Paul (3 March 2019). "MH370: New hope to find missing flight as Malaysia says it could RESUME search". Express.co.uk. ^ Creedy, Steve (4 March 2019). "MH370: Ocean Infinity stands ready to resume search". ^ "Summary of Possible MH370 Debris Recovered" (PDF). Malaysian ICAO Annex 13 Safety Investigation Team for MH370, Ministry of Transport, Malaysia. April 2017. Retrieved 23 October 2017. ^ Mavis Toh (16 August 2017). "New reports offer clues to MH370 location". Flightglobal. ^ Alan Dron (16 August 2017). "New report suggests resting place of MH370". Aviation Week Network. ^ "Australia's CSIRO believes it can locate missing MH370". Aljazeera. 16 August 2017. ^ Final report, p. 103. "The flaperon was the first item of debris positively confirmed to have come from MH370." ^ a b c d e "MH370 search: Réunion debris to be tested in France". BBC News. 30 July 2015. Retrieved 30 July 2015. ^ "MH370 search: Plane debris arrives in France". BBC News. 1 August 2015. Retrieved 2 August 2015. ^ "Le débris d'avion retrouvé fin juillet à La Réunion appartient "avec certitude" au vol MH370, annonce le parquet de Paris" (in French). Francetvinfo. 3 September 2015. ^ Hanna, Jason; Vandoorne, Saskya (3 September 2015). "'Certainty' that Reunion debris from MH370, French official says". CNN. ^ Clark, Nicola (3 September 2015). "Analysis Confirms Plane Debris Came From Malaysia Airlines Flight 370". New York Times. ^ "Plane debris is from missing MH370". BBC News Online. Retrieved 5 August 2015. ^ Adamson, Thomas; Ng, Eileen (2 August 2015). "Malaysia Seeks Help in Finding More Possible MH370 Debris". ABC News. AP. Archived from the original on 4 August 2015. Retrieved 8 August 2015. Malaysia's transport ministry confirmed Sunday that the flaperon that was found has been identified as being from a 777, saying it had been verified by French authorities together with Boeing, the U.S. National Transportation Safety Board and a Malaysian team. ^ a b "France launches search for more MH370 debris on Réunion". France24. 7 August 2015. Retrieved 8 August 2015. The prefect of the French overseas department, Dominique Sorain, said Friday that a helicopter and water vehicles would scour an area 120 kilometres (75 miles) by 40 kilometres (25 miles) around the east coast of the island, where the wing part, known as a flaperon, was found. Bad weather forced the suspension of operations on Friday evening with the search set to begin again on Sunday morning. ^ Aubusson, Kate (31 July 2015). "MH370: Suitcase reportedly found on Reunion [sic] Island, close to where plane debris recovered". Sydney Morning Herald. Retrieved 31 July 2015. ^ "MH370: Aircraft Debris and Drift Modelling". Australian Transport Safety Bureau/The Commonwealth Scientific and Industrial Research Organisation. 4 August 2015. Retrieved 8 August 2015. ^ "Malaysia Airlines Flight 370 Searchers Treating Debris as Major Lead". Retrieved 30 July 2015. ^ "'Chinese water bottle, Indonesian canister' wash up on Reunion Island after possible MH370 wing flap find". South China Morning Post. AFP, Reuters. 31 July 2015. Retrieved 31 July 2015. ^ "MH370 Search: New Items Wash Ashore On Reunion [sic]". Sky News. 31 July 2015. Retrieved 31 July 2015. ^ Mullen, Jethro; Shoichet, Catherine; Fantz, Ashley (6 August 2015). "MH370: More plane debris has washed up on Reunion [sic], Malaysia says". CNN. Retrieved 8 August 2015. ^ Ng, Eileen; Adamson, Thomas (2 August 2015). "Malaysia Seeks Help in Finding More Possible MH370 Debris". ABC News (US). AP. Archived from the original on 4 August 2015. Retrieved 8 August 2015. ^ "MH370: Search on Reunion [sic] island to end Monday". The Star. Malaysia. 14 August 2015. Retrieved 14 August 2015. ^ "France ends search for MH370 debris off Réunion coast". The Guardian. UK. 17 August 2015. Retrieved 17 August 2015. ^ "Object found off Mozambique coast could be MH370 debris, says US report". New Straits Times. 2 March 2016. ^ "Search for MH370: 'High possibility' debris from Boeing 777". BBC Online. 2 March 2016. Retrieved 2 March 2016. ^ "Possible MH370 debris in Mozambique to be sent to Australia for analysis". 3 March 2016. Retrieved 3 March 2016. ^ "ATSB: Two items of debris found on Mozambique coast 'almost certainly' belong to MH370". 19 April 2016. ^ "More debris found on Reunion Island". Sky News Australia. 8 March 2016. Retrieved 8 March 2016. ^ "Suspected new debris found in Reunion Island could be from MH370". Xinhua. 8 March 2016. Retrieved 8 March 2016. ^ "Possible piece of MH370 engine found on South African beach". The Guardian. London. 23 March 2016. ^ Liow, Tiong Lai (22 March 2016). 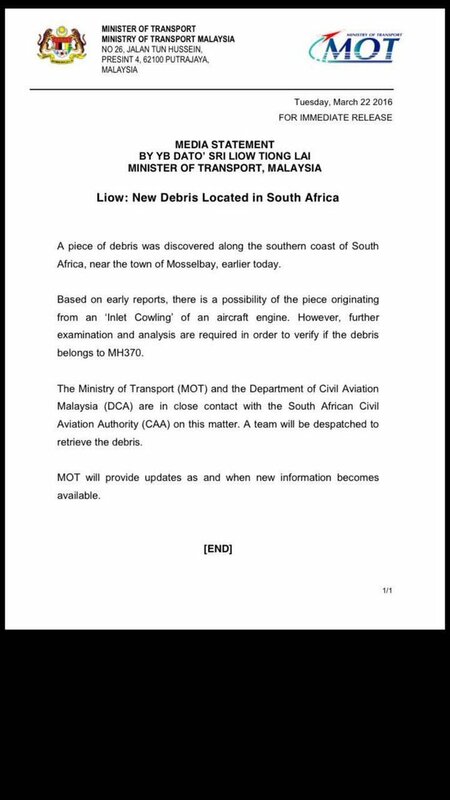 "New Debris Located in South Africa" (Media statement). Ministry of Transport (Malaysia). Archived from the original on 4 November 2018. ^ "MH370 search: New debris found in Mauritius to be examined". BBC News. 3 April 2016. Retrieved 3 April 2016. ^ "Debris found in South Africa, Mauritius 'almost certainly' from MH370: Malaysian minister". ChannelNews Asia. Singapore. 12 May 2016. Retrieved 12 May 2016. ^ "Potential MH370 debris found on island off African coast". The Washington Post. Associated Press. 24 June 2016. Archived from the original on 25 June 2016. ^ "Suspected MH370 debris to be analysed in Tanzania". The Star Online. Star Media Group Berhad. Agence France-Presse. 1 July 2016. Retrieved 2 July 2016. ^ McBride, Brian (20 July 2016). "New Photos Show Wing Flap Believed to Be From Missing MH370". ABC News. ABC News Internet Ventures. Retrieved 20 July 2016. ^ "Malaysia confirms debris found in Tanzania is from MH370". Times of India. Bennett, Coleman & Co. Ltd. Agence France Presse. 15 September 2016. Retrieved 15 September 2016. ^ "MH370 relatives to search for debris in Madagascar". BBC News. 21 November 2016. Retrieved 22 November 2016. ^ Palin, Megan (1 December 2018). "'Massive breakthrough': Flight MH370 'crashed violently'". Cairns Post. Retrieved 2 December 2018. ^ Childs, Nick; Westcott, Richard (6 April 2014). "Malaysia flight MH370: Search ships to verify signals". BBC News. Retrieved 9 May 2014. ^ "MH370 Tragedy: DCA has authority to analyse black box of missing plane Read more: MH370 Tragedy: DCA has authority to analyse black box of missing plane". New Straits Times. 7 April 2014. Archived from the original on 14 July 2014. Retrieved 3 July 2014. ^ "International Panel To Look into MH370 Incident – Hishammuddin". Retrieved 28 September 2014. ^ "Malaysia Airlines flight MH370 puts UN search agency's protocol to the test". South China Morning Post. Retrieved 28 September 2014. ^ a b "Malaysia Reorganizes Flight 370 Investigation, Appoints Independent Investigator". Frequent Business Traveler. 6 April 2014. Retrieved 6 April 2014. ^ "New phase of search starts on both corridors". Free Malaysia Today. Archived from the original on 21 March 2014. Retrieved 30 March 2014. ^ Weaver, Matthew; McCarthy, Tom. "MH370: Australia takes lead in Indian Ocean as search area expands – live". The Guardian. Retrieved 30 March 2014. ^ "Stop Press! Name Change". DST (Press release). 31 July 2015. Archived from the original on 19 September 2015. Retrieved 9 December 2015. As part of the First Principles Review implementation, from 1 July 2015 the Defence Science and Technology Organisation (DSTO) has been renamed as the Defence Science and Technology Group. ^ "Air Chief Marshal Angus Houston to lead Joint Agency Coordination Centre". Archived from the original on 3 November 2014. Retrieved 28 September 2014. ^ Milman, Oliver (30 March 2014). "Flight MH370: former Australian defence chief to co-ordinate search". The Guardian. Retrieved 11 May 2014. ^ Ducos, Jean-Marc (5 August 2018). "La France relance l'enquête sur le MH 370" [France relaunches investigation into MH 370]. Le Parisien (in French). ^ "Disparition du vol MH370 : l'enquête continue" [Disappearance of Flight MH370: the investigation continues]. Le Monde (in French). Agence France-Presse. 19 October 2018. ^ Mullen, Jethro (8 March 2015). "Investigators find no unusual signs among MH370 pilots and cabin crew". CNN. Retrieved 9 March 2015. The report, which contained factual information about the missing plane rather than analysis, offered relatives of the 239 people on board no apparent answers about why the aircraft dropped off radar. ^ Malaysian ICAO Annex 13 Safety Investigation Team for MH370 (8 March 2016). "2nd Interim Statement: Safety Investigation for MH370 (9M-MRO)" (PDF). Retrieved 3 March 2017. ^ a b c "MH370 Safety Investigation Report". Ministry of Transport Malaysia. 30 July 2018. Retrieved 14 August 2018. ^ a b Lyons, Kate; Ellis-Petersen, Hannah; Kuo, Lily; Zhou, Naaman (30 July 2018). "Malaysian investigators release 1,500-page report into disappearance of MH370". The Guardian. London. Retrieved 30 July 2018. ^ "Malaysia aviation chief Azharuddin Abdul Rahman quits over MH370 report". Times Now. 31 July 2018. Retrieved 30 January 2019. ^ "MH370 report: Malaysia aviation chief quits over air traffic failings". The Guardian. London. 31 July 2018. Retrieved 31 July 2018. ^ Wootson Jr., Cleve R. (31 July 2018). "Malaysian aviation chief resigns after investigation found someone veered MH370 off course". The Washington Post. Archived from the original on 1 August 2018. ^ a b c Rayner, Gordon (24 March 2014). "MH370: Britain finds itself at centre of blame game over crucial delays". The Telegraph. Retrieved 26 March 2014. ^ "Classic Aero services and SwiftBroadband". Inmarsat. Retrieved 28 March 2014. ^ Kirby, Mary (14 March 2014). "SITA aids MH370 investigation; expert explains". Runway Girl Network. Retrieved 26 March 2014. ^ a b c Turner, Aimee (16 March 2014). 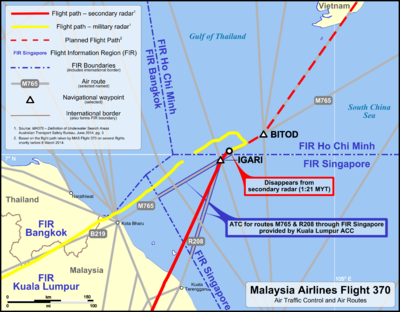 "Malaysian MH370: SATCOMS 101 (Part One)". airtrafficmanagement.net. Retrieved 26 March 2014. ^ a b Prime Minister's Department (Malaysia) (25 March 2014). "Information provided to MH370 investigation by UK Air Accidents Investigation Branch (AAIB)". Department of Civil Aviation Malaysia. Archived from the original on 6 April 2014. Retrieved 6 May 2014. ^ a b c d Ashton, Chris; Bruce, Alan Shuster; Colledge, Gary; Dickinson, Mark (14 September 2014). "The Search for MH370". The Journal of Navigation. 68: 1–22. doi:10.1017/S037346331400068X. Retrieved 19 October 2014. ^ "Considerations on defining the search area – MH370". ATSB – Australian Transport Safety Bureau. Retrieved 28 May 2014. ^ MH370 – Definition of Underwater Search Areas (PDF) (Report). Australian Transport Safety Bureau. 3 December 2015. ^ Han, Esther. "MH370 power outage linked to possible hijacking attempt". Sydney Morning Herald. Retrieved 1 July 2014. ^ Feast, Lincoln (26 June 2014). "Malaysia jet passengers likely suffocated, Australia says". Reuters. Retrieved 29 June 2014. ^ Stacey, Daniel; Pasztor, Andy; Winning, David (26 June 2014). "Australian Report Postulates Malaysia Airlines Flight 370 Lost Oxygen". Wall Street Journal. Retrieved 29 June 2014. ^ Bradsher, Keith (27 June 2014). "Pressure Loss Is Explored in Vanishing of Jetliner". New York Times. Retrieved 29 June 2014. ^ Westcott, Ben (3 November 2016). "MH370 out of control and spiraling fast before crash, report says". CNN. Retrieved 7 July 2017. ^ "MH370 not deliberately crashed by pilot, say investigators". www.bbc.co.uk. 22 May 2018. Retrieved 24 May 2018. ^ a b c Keith Bradsher; Eric Schmitt (9 March 2014). "Passport Theft Adds to Mystery of Missing Malaysia Airlines Jet". The New York Times. Retrieved 12 April 2015. ^ Catherine E. Shoichet & Ray Sanchez (9 March 2014). "Plane bore painters, pilgrims, others from around the world". CNN. Retrieved 8 March 2014. ^ "INTERPOL confirms at least two stolen passports used by passengers on missing Malaysian Airlines flight 370 were registered in its databases". Interpol. Retrieved 9 March 2010. ^ Murdoch, Lindsay (10 March 2014). "Fake passports on Malaysia Airlines flight reveal flaw in airline safety". The Sydney Morning Herald. Retrieved 7 May 2014. ^ Mezzofiore, Gianluca (10 March 2014). "Missing Malaysia Airlines Flight MH370: Iranian Middleman Asked Thai Agent to Book Tickets on Stolen Passports". International Business Times. UK. Retrieved 11 March 2014. ^ Ahmed, Saeed; Shoichet, Catherine E. (11 March 2014). "'There are no answers': Days later, no sign of Malaysia Airlines Flight 370". CNN. Retrieved 11 March 2014. ^ "MISSING MH370: Man with stolen passport on jet is asylum seeker – Latest". New Straits Times. Archived from the original on 13 March 2014. Retrieved 30 March 2014. ^ Dehghan, Saeed Kamali. "Iranians travelling on flight MH370 on forged passports 'not linked to terror'". The Guardian. Retrieved 30 March 2014. ^ Chris Buckley & Keith Bradsher. "China Rules Out Terror Ties Among Citizens on Jet". The New York Times. Retrieved 19 March 2014. ^ "Malaysia police probe flight engineer on missing MH370". The Straits Times. 17 March 2014. Retrieved 2 August 2015. ^ Barbara Starr, Chelsea J. Carter and Jim Clancy. "U.S. officials lean toward 'those in the cockpit' behind missing flight". CNN. Retrieved 16 March 2014. ^ "Deputy PM Warren Truss announces underwater search for missing plane will begin in August". NewsComAu. Retrieved 28 September 2014. ^ "FBI to Quiz Wife of MH370 Pilot Amid Talk of Cockpit Hijack". Mirror Online. 24 March 2014. Retrieved 13 August 2015. Police are also examining reports that he received a two-minute phone call shortly before take-off from a mystery woman using a mobile number obtained using a false identity. ^ Gardner, Frank; Fisher, Jonah (15 March 2014). "Missing Malaysia Airlines plane 'deliberately diverted'". BBC News. Retrieved 9 May 2014. ^ "MH370 passengers "cleared" in four probe areas: Malaysian police". Channel NewsAsia. 11 March 2014. Archived from the original on 6 September 2015. Retrieved 12 April 2015. ^ "Missing plane MH370: Malaysia mystery 'may not be solved'". BBC News. 2 April 2014. Retrieved 9 May 2014. ^ "Malaysian police investigation names MH370 pilot prime suspect". NewsComAu. Retrieved 28 September 2014. ^ Sheridan, Michael (22 June 2014). "Suspicion falls again on Malaysia Airlines flight 370's captain Zaharie Shah". The Australian. Retrieved 3 July 2014. ^ Sheridan, Michael (22 June 2014). "MH370 pilot 'chief suspect'". The Sunday Times. Retrieved 3 July 2014. ^ "Malaysian police investigation names MH370 pilot 'prime suspect'". news.com.au. 23 June 2014. Retrieved 3 July 2014. ^ Thomas, Pierre; Margolin, Josh (2 April 2014). "FBI Finishes Probe into Malaysia Airlines Captain's Flight Simulator". ABC News. Archived from the original on 14 November 2014. Retrieved 7 May 2014. ^ Moore, Andy; Donnison, Jon (29 March 2014). "Flight MH370: Chinese and Australian ships draw blank". BBC News. Retrieved 9 May 2014. ^ Wise, Jeff (22 July 2016). "Exclusive: MH370 Pilot Flew a Suicide Route on His Home Simulator Closely Matching Final Flight". New York Magazine. New York Media. Retrieved 22 July 2016. ^ "MH370 pilot's flight simulator plotted course over southern Indian Ocean". The Guardian. Guardian Media Group. 28 July 2016. Retrieved 28 July 2016. ^ "Malaysia confirms Flight 370 pilot plotted fatal route". CBS News. 5 August 2016. Retrieved 15 May 2018. ^ "MH370 report clears my brother of blame, says pilot's sister". Free Malaysia Today. 31 July 2018. Retrieved 1 August 2018. ^ "MH370: This is everything we now know about aviation's greatest mystery". The Independent. Retrieved 1 August 2018. ^ "MH370: Safety investigation report released today not final". bernama.com. Retrieved 1 August 2018. ^ "MH370: Safety investigation team unable to determine real cause of disappearance". www.bernama.com. Retrieved 1 August 2018. ^ Calder, Simon (30 July 2018). "MH370: Everything we now know about aviation's greatest mystery". The Independent. Retrieved 13 September 2018. ^ Levin, Alan (11 August 2014). "Exploding Lithium Batteries Riskier to Planes: Research". Bloomberg Business. Retrieved 1 August 2015. ^ a b c Knowler, Greg (15 April 2015). "Cathay slaps blanket ban on bulk lithium battery shipments". The Journal of Commerce. Retrieved 1 August 2015. ^ a b "Safety worries lead U.S. airline to ban battery shipments". BBC News. 3 March 2015. Retrieved 1 August 2015. ^ Jansen, Bart (25 July 2013). "Crash investigators trace UPS plane fire to batteries". USA Today. Retrieved 1 August 2015. ^ Pearlman, Jonathan (3 April 2014). "MH370: Malaysian police probe fruit farmers as investigation widens". The Telegraph. Retrieved 1 August 2015. ^ Hodal, Kate (14 March 2014). "Flight MH370: a week of false leads and confusion in hunt for missing plane". The Guardian. Retrieved 25 March 2014. ^ a b "Missing Malaysia Airlines flight MH370 – a week of confusion". The Sydney Morning Herald. 14 March 2014. Retrieved 7 May 2014. ^ "Missing Malaysia Airlines plane: Air force chief denies tracking jet to Strait of Malacca". Retrieved 28 September 2014. ^ "MH370: Further confusion over timing of last words". Archived from the original on 9 April 2014. Retrieved 28 September 2014. ^ Jamieson, Alastair (13 March 2014). "Officials Deny Engine Data Report From Missing MH370". NBC News. Retrieved 12 April 2015. ^ Calder, Simon; Withnall, Adam (17 March 2014). "Missing Malaysia Airlines Flight MH370: Confusion deepens over 'missing 30 minutes' at heart of mystery engulfing stricken jet". The Independent. ^ Woodrow Bellamy III (19 March 2014). "Malaysian PM Clarifies MH370 Avionics Disablement". Avionics International. Retrieved 30 January 2019. ^ "Not just mangosteens on board, MH370 also carried lithium-ion batteries, says daily". The Malaysian Insider. 22 March 2014. Archived from the original on 5 September 2015. Retrieved 12 April 2015. ^ "MH370: "All right, good night" came after system shut down". The Malaysian Times. 17 March 2014. Retrieved 31 March 2014. ^ "Malaysia Airlines flight MH370 co-pilot's last message was 'all right, good night' – video". The Guardian. 17 March 2014. Retrieved 31 March 2014. ^ "Last words transmitted from missing Malaysia Airlines plane were actually 'Good night, Malaysian three seven zero'". News.com.au. 1 April 2014. Retrieved 1 April 2014. ^ "New account of MH370 pilot's final words". Al Jazeera. Retrieved 31 March 2014. ^ Donnison, Jon; Westcott, Richard (31 March 2014). "MH370: New account of cockpit last words". BBC News. Retrieved 8 May 2014. ^ "Stolen Passports on Plane Not Seen as Terror Link". The New York Times. 11 March 2014. Retrieved 15 March 2014. ^ Denyer, Simon (12 March 2014). "Contradictory statements from Malaysia over missing airliner perplex, infuriate". The Washington Post. Archived from the original on 13 March 2014. ^ a b c d Malakunas, Karl (14 March 2014). "Distrust adding to Malaysian jet confusion: analysts". Agence France-Presse. Retrieved 17 January 2015. ^ a b c Branigan, Tania (14 March 2014). "Malaysia flight MH370 hunt sees suspicion and cooperation". The Guardian. Beijing. Retrieved 11 May 2014. ^ Harlan, Chico; Denyer, Simon (11 March 2014). "Malaysia Airlines plane may have veered wildly off course during flight, military says". The Washington Post. Archived from the original on 12 March 2014. ^ "China appeals to Malaysia for search information". Associated Press. 14 March 2014. Archived from the original on 14 March 2014. Retrieved 14 March 2014. ^ Spoonts, Sean (22 March 2014). ""Alright, Goodnight" – Does Malaysia Want To Know What Happened To Flight MH-370?". SOFREP.COM (Special Operations Forces Report-Special Ops News & Intel). Sean Spoonts. Retrieved 10 May 2014. ^ Pasztor, Andy; Ostrower, Jon; Hookway, James (19 March 2014). "Critical Data Was Delayed in Search for Missing Malaysia Airlines Flight MH 370". The Wall Street Journal. Retrieved 12 April 2015. ^ Hishammuddin Hussein (21 March 2014). "MH370 Press Briefing by Hishammuddin Hussein on 21st March 2014". Malaysia: Department of Civil Aviation Malaysia. Archived from the original on 31 May 2014. Retrieved 6 May 2014. ^ a b "MH370 Is Missing With 239 People on Board, Help The Families Find The Truth". Indiegogo. Archived from the original on 10 April 2015. Retrieved 10 April 2015. ^ Molko, David; Yan, Holly (9 June 2014). "MH370 families seek $5 million for investigation, reward". CNN. Retrieved 10 April 2015. ^ a b c d Raghuvanshi, Gaurav; Ng, Jason (6 April 2014). "Malaysia Airlines Says Priority Is Families of the Missing, Though Ticket Sales Fall". Wall Street Journal. Retrieved 3 July 2014. ^ "Malaysia Airlines to Retire Call Sign 370". The Wall Street Journal. 13 March 2014. Retrieved 30 August 2014. ^ Neuman, Scott (13 March 2014). "When Bad Things Happen To Planes, Flight Codes Get 'Retired'". Retrieved 30 August 2014. ^ a b c d Hong, Zhang; Zhou, Laura (26 March 2014). "Chinese tourists boycott Malaysia in wake of MH370 disappearance". South China Morning Post. Retrieved 30 August 2014. ^ Boyle, Charles (27 March 2014). "Complex Situation Occludes Details on Loss of Malaysian Airlines Flight MH370". Insurance Journal. Retrieved 17 July 2014. Allianz Global Corporate & Specialty has been identified as both the lead insurer and the lead reinsurer. An Allianz spokesperson in London confirmed that it is officially the latter. ^ Mathew, Jerin (15 May 2014). "Missing Malaysian Airlines Flight MH370 Hits Allianz with $30m Bill". International Business Times. Retrieved 17 July 2014. The insured market loss on the aeroplane is about $350m, which include the costs for searching. ^ "Malaysia Airlines Financial Losses Grow". New York Times. Reuters. 29 August 2014. Retrieved 30 August 2014. ^ Hamzah, Al-Zaquan Amer; Leong, Trinna; Ngui, Yantoultra (8 August 2014). "Malaysia Airlines To Go Private With A$435 Million Government Investment". Business Insider. Retrieved 9 August 2014. ^ Mouawad, Jad (8 August 2014). "Malaysia Steps in to Save Its Reeling National Airline". New York Times. Retrieved 9 August 2014. ^ a b c "Missing Malaysia Airlines flight MH370 puzzle raises legal problems". Sydney Morning Herald. 11 May 2014. Retrieved 17 July 2014. ^ Bishop, Katrina (25 March 2014). "MH370 families face huge compensation disparity". CNBC. Retrieved 17 July 2014. ^ Wallace, Gregory (26 March 2014). "Malaysia Airlines Flight 370: How much will families be paid?". CNN Money. Retrieved 17 July 2014. ^ a b "MH370: Malaysia declares flight disappearance an accident". BBC News. Retrieved 29 January 2015. ^ "American law firm plans to bring suit against Boeing and Malaysia Airlines". South China Morning Post. Reuters. Retrieved 31 January 2015. ^ Liljas, Per (26 March 2014). "Family Member Files Lawsuit Over Missing Jet as Frustrating Search Continues". Time. Retrieved 31 January 2015. ^ Phillip, Abby (31 October 2014). "Two Malaysian boys sue airline, government in first case after MH370's mysterious disappearance". The Washington Post. Archived from the original on 31 October 2014. ^ "MH370 disappearance: Chinese families file lawsuits seeking answers". BBC News. 7 March 2016. Retrieved 18 March 2017. ^ a b "MAS cash aid snubbed by kin of Chinese aboard MH370". The Malay Mail. 11 March 2014. Retrieved 12 March 2014. ^ "Flight 370: Malaysia Airlines begins insurance payments". The Times of India. 13 June 2014. Archived from the original on 25 March 2016. Retrieved 17 July 2014. [Hamzah Zainuddin] said full payout would come after the plane is found or officially declared lost. ^ Malaysia Insider (8 July 2011). "MH370 throws spotlight on Malaysia's air force and radar capabilities". The Malaysian Insider. Archived from the original on 5 September 2015. Retrieved 12 April 2015. ^ Childs, Nick (16 March 2014). "Missing Malaysia plane: MH370 and the military gaps". BBC News. Retrieved 9 May 2014. ^ a b c "Malaysia lets slip chance to intercept MH370". malaysiakini. Malaysiakini. 17 March 2014. Retrieved 6 April 2014. ^ a b Campbell, Charlie (17 March 2014). "Another Lesson from MH370: Nobody is Watching Malaysian Airspace". Time. Retrieved 20 November 2014. ^ a b Razak, Najib (13 May 2014). "Malaysia's Lessons From the Vanished Airplane". The Wall Street Journal. Retrieved 22 November 2014. ^ a b Henderson, Barney (3 April 2014). "MH370 Malaysia Airlines: Anwar Ibrahim says government purposefully concealing information". The Daily Telegraph. Retrieved 6 April 2014. ^ "Multiple authorities let Malaysia Airlines flight MH370 disappear: ABC". Yahoo News 7. 20 March 2014. Retrieved 22 November 2014. ^ Kingsbury, Damien (20 March 2014). "A sclerotic Malaysian government stumbles in MH370 crisis". Crikey. Retrieved 22 November 2014. ^ Eileen Ng, Associated Press (8 March 2016). "Malaysian PM says hopeful that Flight 370 will be found". Houston Chronicle. Retrieved 8 March 2016. ^ Keith Bradsher; Edward Wong; Thomas Fuller. "Malaysia Releases Details of Last Contact With Missing Plane". The New York Times. Retrieved 25 March 2014. ^ Hatton, Celia (25 March 2014). "Malaysia Airlines MH370: Relatives in Beijing scuffles". BBC News. Retrieved 9 May 2014. ^ "China's Xi to send special envoy to Malaysia over missing plane". Yahoo! News. 25 March 2014. Retrieved 1 April 2014. ^ "MH370 passengers' relatives protest in China". Al Jazeera. 25 March 2014. Retrieved 25 March 2014. ^ "(Flight MH370) Message from Beijing: "Liars"". The Standard. 25 March 2014. Archived from the original on 7 April 2014. Retrieved 6 April 2014. ^ Branigan, Tania (30 March 2014). "Flight MH370: Chinese relatives demand apology from Malaysia". The Guardian. Retrieved 6 April 2014. ^ Mei, Xinyu (31 March 2014). "Treat MH370 tragedy rationally". China Daily. ^ Jha, Supriya (3 April 2014). "Developments over Malaysian jet search: As it happened". Z News. Retrieved 6 April 2014. ^ a b Murdoch, Lindsay (3 April 2014). "Flight MH370: Police investigate whether food on missing plane was poisoned". The Sydney Morning Herald. Retrieved 3 April 2014. ^ Schmitt, Eric; Semple, Kirk (15 April 2014). "Flight MH370: Missteps by China slowed search for missing jet". The Economic Times. Retrieved 17 January 2015. ^ "China gets taste of world criticism in MH370 hunt". The Malay Mail. Retrieved 23 April 2014. ^ "Flight MH370: Chinese families file suit ahead of 2nd anniversary of plane's disappearance". Cbc.ca. 8 March 2016. Retrieved 8 March 2016. ^ a b Demick, Barbara (28 March 2014). "Chinese boycott Malaysia over missing jetliner". Los Angeles Times. Retrieved 30 August 2014. ^ Millward, Steven (28 March 2014). "As outrage grows over missing flight, Chinese websites ban Malaysia Airlines ticket sales". TechInAsia. Retrieved 30 August 2014. ^ a b Gat, Aviva. "Several Chinese travel booking sites boycott Malaysia Airlines". Geektime. Retrieved 30 August 2014. ^ "Malaysia to face losses of up to RM4 billion in tourism revenue due to MH370, say analysts". The Malaysian Insider. 27 March 2014. Archived from the original on 3 September 2014. Retrieved 30 August 2014. ^ "Chinese celebs lash out at M'sia over MH370". Yahoo! Malaysia. Malaysiakini. 27 March 2014. Archived from the original on 4 September 2014. Retrieved 30 August 2014. ^ "How do you track a plane?". BBC News. 17 March 2014. Retrieved 25 November 2014. ^ Rolphe, Martin (17 September 2014). "The future of aircraft surveillance and tracking". nats.aero. Retrieved 12 April 2015. ^ a b Pasztor, Andy (13 July 2014). "How to Avoid Another Malaysia Flight 370". The Wall Street Journal. Retrieved 3 December 2014. ^ Pasztor, Andy (14 May 2014). "After MH370, Air-Tracking Plan Unveiled". The Wall Street Journal. Retrieved 3 December 2014. ^ a b "Industry Addressing Aircraft Tracking Options". IATA. 3 June 2014. Retrieved 25 November 2014. ^ a b Domínguez, Gabriel (22 August 2014). "What has the aviation industry learned from Flight MH370?". Deutsche Welle. Retrieved 19 October 2014. ^ Martell, Allison (30 September 2014). "Task force delays aircraft tracking plans promised after MH370 mystery". Reuters. Reuters. Retrieved 8 October 2014. ^ "UN Aviation Body to Propose 15-minute Flight Tracking Standard". Voice of America. Reuters. 6 January 2015. Retrieved 24 January 2015. ^ Peterson, Barbara (12 December 2014). "Here's Why Airliners Still Don't Have Real-Time Tracking Tech". Popular Mechanics. Retrieved 24 January 2015. ^ a b c d Lowy, Joan (4 March 2016). "Airlines slow to adopt safety technologies after MH370". phys.org. Science X Network. Associated Press. Retrieved 21 April 2016. ^ a b c "ICAO updates Annex 6 with requirements to help avoid recurrence of MH370-type disappearances". Aviation Safety Network. 7 March 2016. Retrieved 21 April 2016. ^ "Inmarsat offers to track aircraft for free after Malaysia Airlines disaster". The Daily Telegraph. 12 May 2014. Retrieved 4 April 2015. ^ "Why can plane transponders be turned off from the cockpit?". CBS News. 19 March 2014. Retrieved 19 March 2014. ^ Stupples, David (9 April 2014). "MH370 should make us rethink how we monitor planes". Phys.org. Retrieved 20 January 2015. ^ de Castella, Tom (25 March 2014). "Malaysia plane: Why black boxes can't always provide the answers". BBC News. Retrieved 22 January 2015. ^ a b Allard, Tom (28 April 2014). "MH370: Expert demands better black box technology". Sydney Morning Herald. Retrieved 21 January 2015. ^ Yu, Yijun (19 March 2014). "If we'd used the cloud, we might know where MH370 is now". Phys.org. Retrieved 21 January 2015. ^ "EASA certifies first Long Range Underwater Locator Device designed and manufactured in Europe". European Aviation Safety Agency. 4 April 2017. Retrieved 9 February 2019. ^ "Dukane Seacom Creates First Certified 90 Day Underwater Locator Beacon; Extended Triple Life will Facilitate Aircraft Recovery Efforts" (PDF) (Press release). HEICO Corporation. 23 June 2015. Retrieved 19 August 2016. ^ Huerta, Michael P. (22 January 2015). "Safety Recommendation: A – 15 – 1 through – 8" (PDF). NTSB. Retrieved 13 February 2015. ^ "NTSB Calls for Better Ways to Find Aircraft Accident Sites and Retrieve Critical Flight Data". NTSB. 22 January 2015. Retrieved 13 February 2015. "Can Malaysia Airlines Survive Another Tragedy?". Huffington Post. Retrieved 4 January 2015. "Reporter Velez-Mitchell: Saturation News Coverage 'Twists Reality'". Newsmax. Retrieved 4 January 2015. "Transcripts". CNN. Retrieved 12 April 2015. "Malaysia Airlines disappearance joins greatest mysteries of all time". PIX 11. Retrieved 4 January 2015. "The most read stories of 2014 on KOMONews.com". KOMO News. Retrieved 4 January 2015. "World Headlines". OSV Newsweekly. Retrieved 4 January 2015. ^ Williams, David. "Flight MH370 is still missing, but the search has revealed two ships that vanished 140 years ago". edition.cnn.com. Retrieved 4 May 2018. 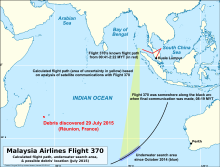 ^ "Malaysia 370: The Plane That Vanished". Smithsonian Channel. Archived from the original on 28 July 2014. Retrieved 18 June 2014. ^ Morabito, Andrea (3 April 2014). "Smithsonian Channel will air documentary on missing jet". New York Post. Retrieved 18 June 2014. ^ "Flight 370: The Missing Links". Discovery Channel (Asia). Discovery Networks International. Retrieved 18 June 2014. ^ Kemp, Stuart (2 April 2014). "Discovery Networks International Orders Special on Malaysia Flight 370". The Hollywood Reporter. Retrieved 18 June 2014. ^ "Where is Flight MH370?". BBC Two. BBC. Retrieved 12 June 2014. ^ "Why Planes Vanish". NOVA. WGBH. Retrieved 10 October 2014. FOR BBC Where is Flight MH370? ^ "NOVA – Why Planes Vanish". pbs.org. PBS. Retrieved 10 October 2014. ^ John Goglia (8 October 2014). "Why Planes Vanish: NOVA Documentary Explores What Happened to Missing Malaysia Boeing-777". Forbes. Retrieved 11 October 2014. ^ "The Surprisingly Good Flight 370 Novel: Author Scott Maka Defends His Controversial Book". The Daily Beast. Retrieved 3 July 2014. ^ "Air Crash Investigation". National Geographic. Archived from the original on 13 February 2015. Retrieved 13 February 2015. ^ "Airdate: Drain the Oceans". TV Tonight. 4 July 2018. Retrieved 21 August 2018. ^ "The Best New Social Thriller Is a Podcast". Retrieved 18 September 2018. Wikimedia Commons has media related to aircraft 9M-MRO. "A Timeline of MH370 Physical Evidence". Aviation Week & Space Technology. 8 March 2019. MH 370 Preliminary Report – Preliminary report issued by the Malaysian Ministry of Transport, dated 9 April 2014 and released to the public on 1 May 2014. Factual Information: Safety Investigation for MH370 – Interim report released by the Malaysian Ministry of Transport on 8 March 2015 (586 pages). MH370 – Definition of Underwater Search Areas (2014) – Report by the Australian Transport Safety Bureau, released on 26 June 2014, and the most comprehensive report on Flight 370 publicly released at that time. The report focuses on defining the search area for the fifth phase, but in doing so provides a comprehensive overview/examination of satellite data, the failed searches, and possible "end-of-flight scenarios". MH370 – Definition of Underwater Search Areas (2015) – Report by the Australian Transport Safety Bureau, released on 3 December 2015, covering the Bayesian method analysis made by Australia's Defence Science and Technology Group and other developments since mid-2014 in defining the search area. MH370 – Search and debris examination update (2016) – Report by the Australian Transport Safety Bureau, released on 2 November 2016, comprising further analysis of satellite data, additional End of Flight simulations, analysis of flight debris (wing flap), and enhanced debris drift modelling. MH370 First Principles Review and CSIRO reports – Report by the Australian Transport Safety Bureau, released on 20 December 2016, documenting the proceedings and outcomes of the First Principles Review meeting held in Canberra between 2–4 November 2016. The review identified a previously unsearched area of 25,000 km2 (9,700 sq mi) as having the highest probability of containing the aircraft wreckage. 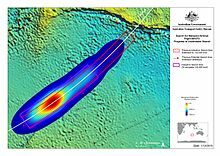 The search for MH370 and ocean surface drift – Part III – Report by CSIRO to the Australian Transport Safety Bureau, released on 16 August 2017. From the results of drift studies, CSIRO mentions that it is possible to identify a most-likely location of the aircraft, with unprecedented precision and certainty, at 35.6°S 92.8°E, northeast of the main 120,000-km2 underwater search zone. Summary of imagery analyses for non-natural objects – Report by Geoscience Australia, released on 16 August 2017, comprising analysis of imagery from the PLEIADES 1A satellite, of floating objects identified in the southern Indian Ocean. The Operational Search for MH370 (Final) – Final report issued by the Australian Transport Safety Bureau (ATSB), released on 3 October 2017, documenting where and how the search for MH370 was conducted, the results obtained, and analysis for where future underwater searches could be undertaken. It concludes that the reasons for the loss of MH370 cannot be established with certainty until the aircraft is located. Safety Investigation Report by The Malaysian ICAO Annex 13 Safety Investigation Team for MH370 with appendices – Final report issued by the Malaysian Ministry of Transport, dated 2 July 2018 and released to the public on 30 July 2018.